SOFA: A hand-made, camel-back sofa, with splayed arms and legs, from the late 20th c. An incredibly soft and fine paisley wool covers the seat cushion and bolster. CHAIRS: A pair of striped and curvy bent cane chairs, dating from the early 1900s with oilcloth seats. These are in amazingly good condition, considering their age. TABLE: Matches the two chairs with its top covered in the same oilcloth. 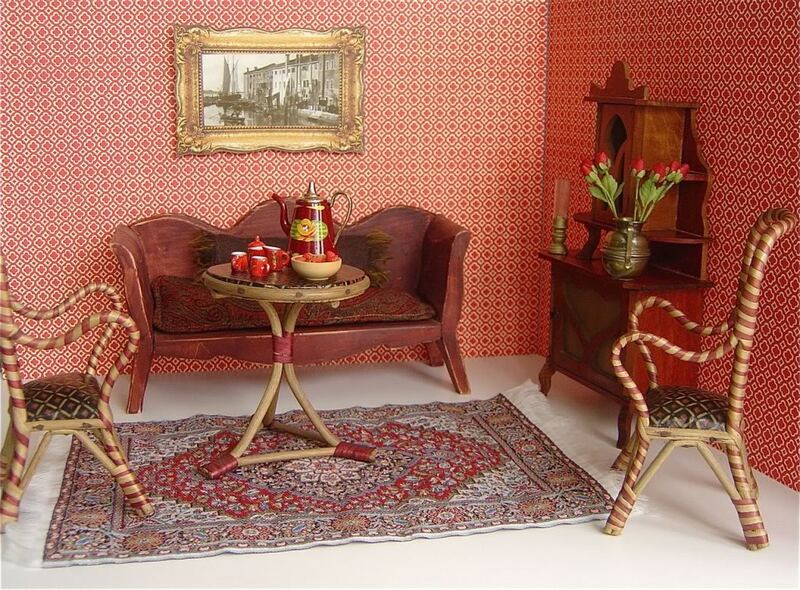 On top is a vintage, hand-painted bargeware coffeepot, a bowl of strawberries and three, modern red, ceramic mugs. 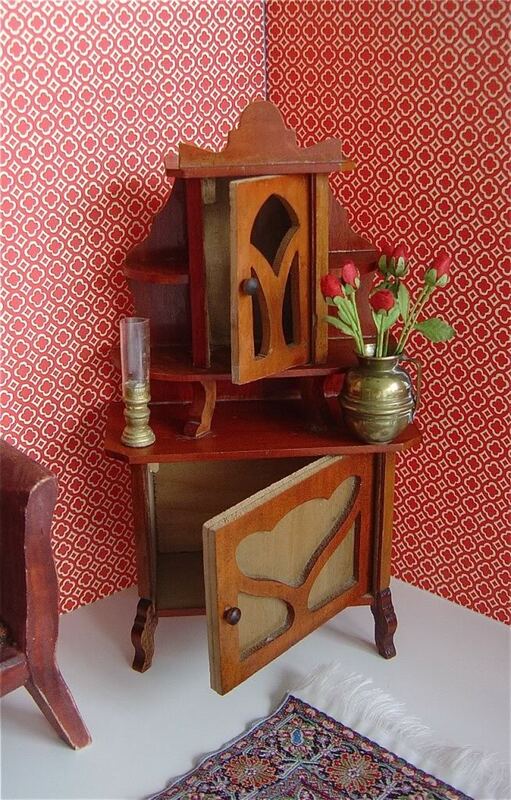 CABINET: An incredibly crafted, antique Art Nouveau piece, with two opening doors, made from a variety of woods. On the cabinet a vintage brass jug holds a bunch of paper roses. FRAGILITY NOTE: This is quite a delicate piece, due to the way the cornice and legs stick out. Please take care when unpacking and handling it. RUG: A wonderfully made cotton "oriental" rug from France, vintage unknown, but a really beautiful item. 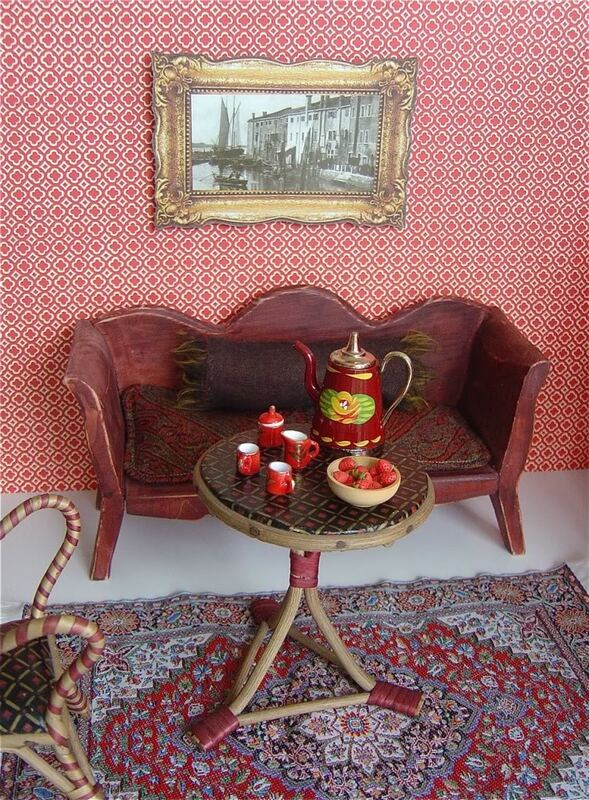 WALLS: Covered in a classic Italian wrapping paper, which has been mounted on two A3 pieces of 5mm thick foam board. Each piece of foam board measures 42 x 29.5cm or 11 5/8 x 16 3/8in. A photocopy of a turn of the century Venetian scene in a paper frame is "hung" on the wall using a tiny piece of Velcro. 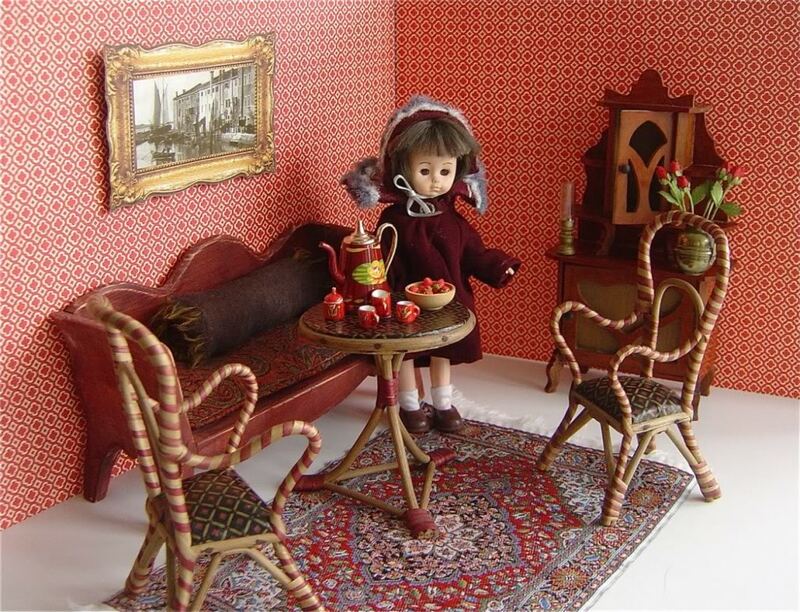 Dolls: Available from our selection of vintage dolls – please see the relevant section of our website. Shown here, a Lesney Ginny in excellent condition, with long brown hair and bendable knees. Price: £35 with vintage coat, hat, socks and shoes shown. Additional clothing for this doll is available – please see the relevant section of our website.